Terry Farrell: "Farrell Review has empowered architects to shape policy"
It is five years since we published the Farrell Review of Architecture and the Built Environment. It is extraordinary to think how much has changed in the UK since then. We talked about the housing crisis, but didn't expect it to get exponentially worse. We talked about action on climate change, which also appears to have gone backwards, or at least stood still. In its own small way though, the review has made a difference and its cumulative achievements have been impressive. For me it shows the power of ideas, particularly when they are formed independently of party politics or professional biases. It shows how important it is to people to improve their everyday built environment and to make the ordinary better. Most of all, it shows how crucial it is to engage with a wider audience if you want to bring about meaningful change. When I was interviewed by Dezeen at the time, the article ran with the headline "architects don't affect things very much". In terms of architecture's influence within government, this was true at the time. As a result of the Farrell Review however, architecture has moved out of the government's Department for Culture, Media & Sport (DCMS) and into the Ministry for Housing, Communities & Local Government (MHCLG), a department with considerably more clout. The House of Lords established its first-ever Select Committee on the Built Environment and published a wide-ranging report. Plus the government announced the appointment of a chief architect, another key recommendation. All of these moves have empowered architects and designers to play a more central role in shaping policy, although they haven't been without controversy. As Sunand Prasad said at the time, "Good people can get around bad policies, but good policies can't get around bad people". The appointment of Roger Scruton to lead the Building Better, Building Beautiful commission has come in for considerable criticism and rightly so in my opinion. In the review we talked about the end of the style wars and it not being "either/or any more" between tradition and modernity. We don't want these old wounds to be opened up again, now that the world has moved on. Critically, the review didn't look to the government to provide all the answers. Myself and the panel were convinced that real change would only come about by engaging with the public and by skilling up decision makers. When Dezeen asked me five years ago to choose one recommendation I would most like to see happen, I chose urban rooms. I see these as places where people can go to find out about the past, present and future of their place. Never in my wildest dreams did I expect them to take off in the way they have, with over 15 throughout the country and many more being planned. I am so taken by the idea that I have agreed to donate £1 million to Newcastle University where I studied architecture, along with my archive, to establish an urban room there. There have been a number of organisations and individuals who have also picked up the baton. Professor Matthew Carmona established the Place Alliance, a membership organisation that is free to join and open to all, which is taking forward many of the review's recommendations. Colin Davis addressed one of the review's major concerns, that decisions made by highways engineers affect our towns and cities. He published Streetscapes to establish the basic principles of quality street design. Urban Design London answered the call to skill up local-authority officers and councillors by publishing the Design Companion for Planning and Placemaking, sending copies to local authorities throughout the country. Meanwhile Finn Williams set up Public Practice, which has led a quiet revolution addressing the ravages of funding cuts on local authority planning departments. Now in its second year and with double the number of placements from London councils, it is looking to branch out to regions beyond the capital, placing much needed architects and urban designers within local authority planning departments. One of the main aims of the review was to change the culture of planning, from being reactive and policy-led to being proactive and creative. Initiatives like Public Practice are putting planning back on the front line tackling the biggest issues of our time, like climate change and the housing crisis. Intelligent masterplanning and quality design can overcome nimbyism and trust can be built within communities by working closely with them. But this can only be done by changing the way we do things and by councils, developers, architects and communities working together in partnership – something I have seen happen more and more in recent years. Not only did the review make recommendations that became reality, it also gave oxygen to ideas that were already out there. Look at Will Hunter's radical new model for architectural education, which became the London School of Architecture, and Croydon's Place Review Panel, an evolution of the design review format. What they all have in common is inclusivity and collaboration. At Farrells, we responded to the review's call to improve the everyday built environment, by focusing on projects which do just that. Some of our recent schemes include the conversion of a tired office building into high-quality apartments and a new business district in the Royal Docks that takes advantage of modular construction. In the interview five years ago, I said I wanted to raise people's expectations for the quality of their built environment: their streets, their houses and their public buildings. I felt we were messing up high streets and hospitals that started out well-designed, that the media was too focused on the shiny and the new to notice we were ignoring the bits that mean the most to most people. I think this is one area where little progress has been made. I appeal to anyone interested to step forward and champion this cause. The review was a huge undertaking and I would think twice about doing it again. But I do feel it has made a difference. That makes me proud, and gives me hope for the future. One of the reasons why I think it has endured is its breadth and independence. The built environment is complex and multi-layered, the work of many hands over time. Progress can only be made when it cuts across professional silos and avoids party politics. We used the word PLACE as an acronym to bring together the professions of planning, landscape, architecture, conservation and engineering, for example. These professional institutions are increasingly working together and speaking with one voice on important issues. There are cross-disciplinary courses out there which can give people a broad grounding, like foundation courses in the arts. I was lucky enough to qualify as a planner and an architect, but this is very difficult to do in an age of tuition fees, so foundation courses must be the way forward. When I was awarded the Gold Medal by the Royal Town Planning Institute in 2017, I was the first architect to receive it since Patrick Abercrombie in 1955. Hopefully I won't be the last. My son Max was the project leader for the Farrell Review and wrote most of its 40,000 words. He has kept the initiative going and will continue to lead it over the next five years. We are hosting an event at the RIBA on 21 February to mark the fifth anniversary and to ask what more can achieved. We are delighted to have the many of the individuals mentioned here as speakers, as well as review panel members Alison Brooks and Sunand Prasad, and cross-party involvement from government. Sadly, not all of the panel members will be joining us for this event. Hank Dittmar passed away last year and he will be sorely missed. Hank made a significant contribution throughout his career, advising policy makers from the UK to the US and Australia. I am very grateful to him for his commitment and thoughtfulness. My plea would be for others to step forward and voluntarily start championing these causes, rather than waiting to be asked. There's so much more that needs to be done. You only have to listen to David Attenborough explaining the crisis of climate change or Shelter revealing the extent of homelessness, as a result of the crisis of affordability in our towns and cities. All it takes is leadership, and leadership can come from anywhere. Terry Farrell is considered the UK's leading architect planner, with offices in London and Hong Kong and Shanghai. During 50 years in practice he has completed many award winning buildings and masterplans including Embankment Place and The Home Office Headquarters, as well as millennium projects such as The Deep in Hull and Centre for Life in Newcastle. Throughout his career he has championed urban planning and helped shape government policy on key issues. In 2014, he and his firm commenced the Farrell Review of Architecture and the Built Environment, to offer expert guidance on the direction of British architecture. 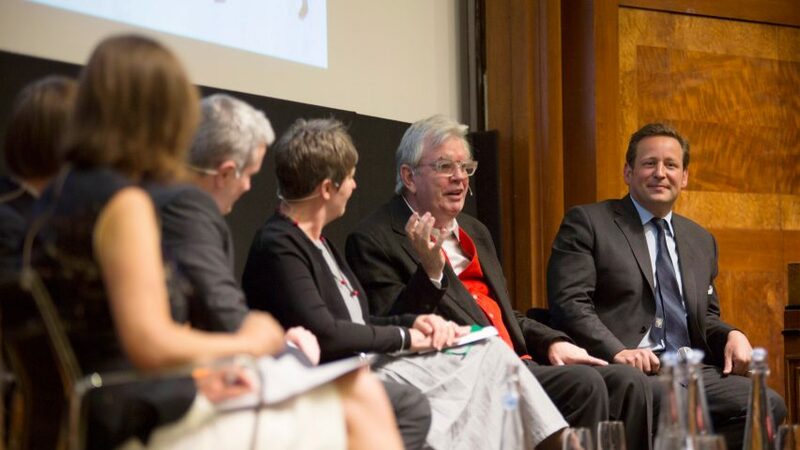 The Farrell Review Anniversary Event takes place at the RIBA at 66 Portland Place, London, on 21 February 2019. Dezeen readers receive a discount on tickets from Eventbrite using the code "Dezeen".